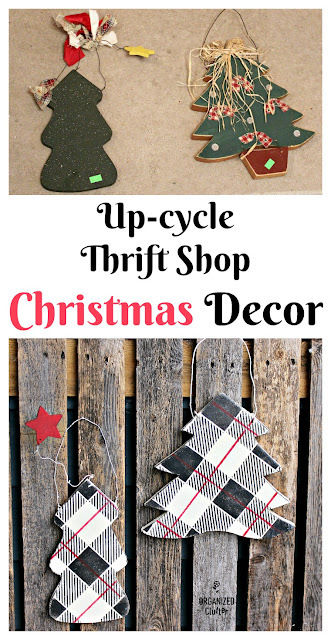 One of my local thrift shops just put out Christmas decor. The wooden tree on the left was $.99, and the one on the right was $1.99. One is marked on the back 1996. 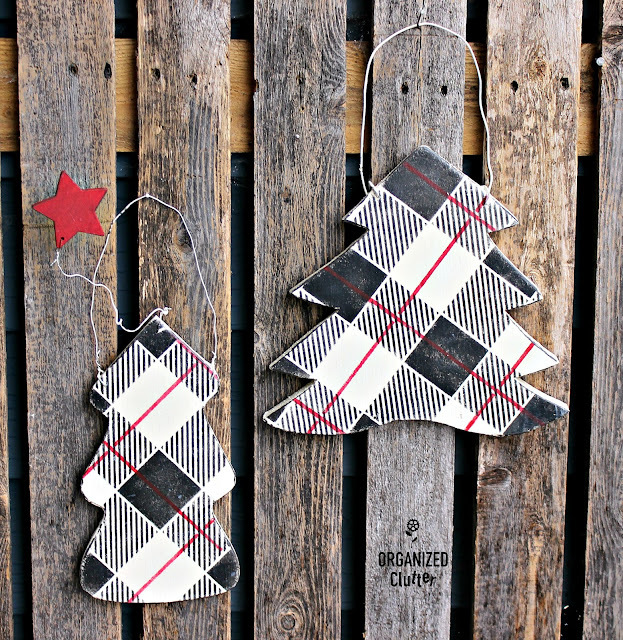 These tired Christmas trees need a makeover. First I untied all the rag ribbons on the wires, and removed them. Next I used a blow dryer on the hottest setting to soften up the hot glue that held on the ribbon and buttons. Then I used a combination of my finger nail and a screwdriver to remove the hot glue remnants. I also sanded the top wood surfaces with 100 grit sand paper to smooth the top sides even further. 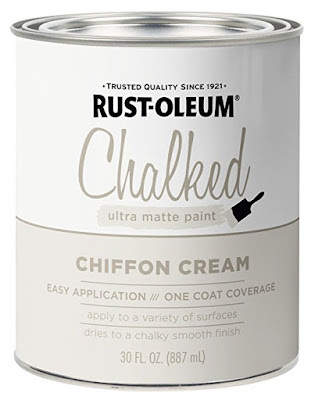 Next I brushed on a couple of coats of Rustoleum Chalked Paint in Chiffon Cream . I painted the wires too. I ended up not liking the tree base. Too many wires! I removed it. 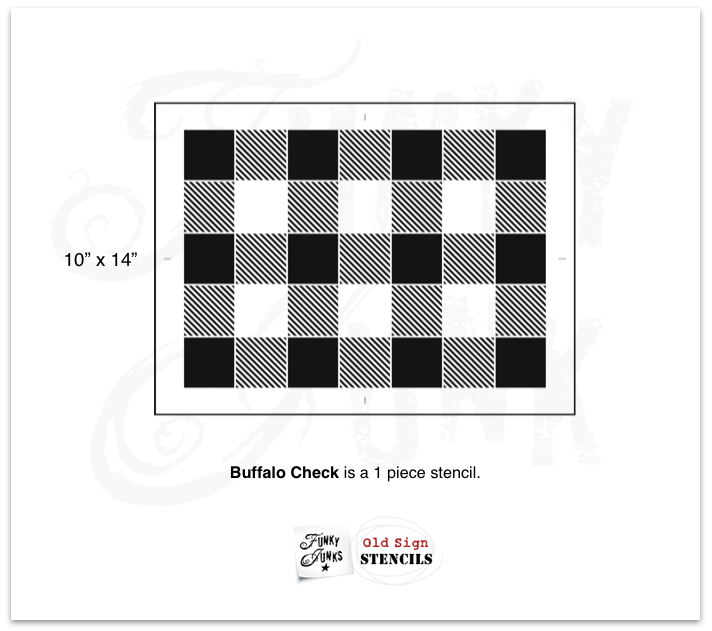 I then pulled out my *Old Sign Stencils buffalo check stencil available HERE. 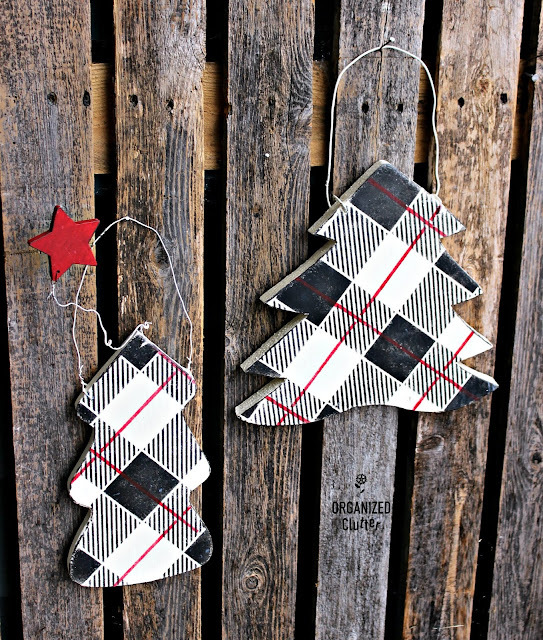 I laid the stencil on the trees on the diagonal. 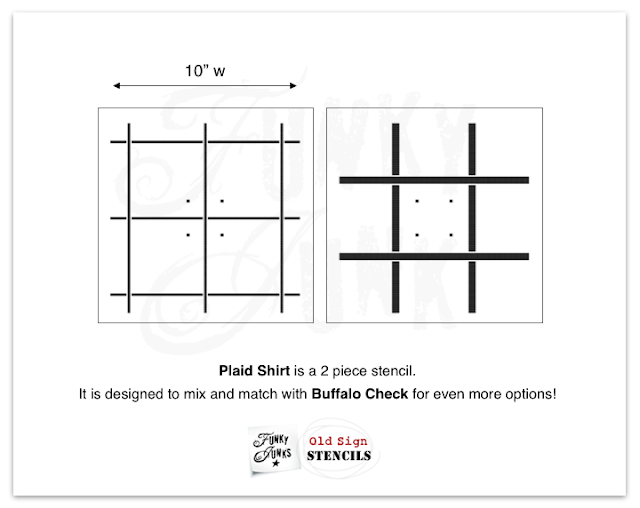 When my item to be stenciled is small, I like using the stencil on the diagonal. You could tape the stencil on with blue painter's tape. For this small project, I just held it down with my finger, using extreme care not to move the stencil. I used Fusion Mineral Paint in Coal Black to stencil on the pattern. I wasn't quite satisfied with my trees yet, so I added the thinner lined stencil from the *Old Sign Stencils Plaid Shirt stencil available HERE to add a red line with Deco Art Chalky Finish Paint In Rouge . I sealed the stenciling and Chalked Paint with Deco Art Creme Wax in Clear . Give that thrift shop dated Christmas decor a second look! 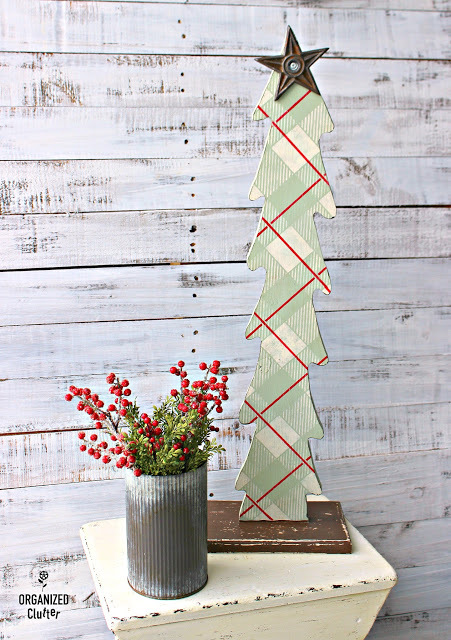 This was an ugly thrift shop Christmas tree I upcycled last year HERE. Super cute !~ Love this makeover! Carlene, you are so talented and have such a creative imagination! Thanks for sharing! Ok that does it! I am coming to you the next time I need inspiration. You do some of the cutest stuff!